This weekend is my guild's quilt show! But let me tell you about getting ready for the quilt show (there'll be more posts about the show later)! I finished sewing on all my sleeves on Monday, hooray. (Turns out two of my quilts didn't need sleeves because they were draped over things instead of hung, hrumpf). I had a tiny problem regarding the drop off, because it was scheduled during working hours. Luckily, the lady who chaired the show committee parks in front of my house on work days, so I could do a drop-off with her at 7:20 in the morning. That was Wednesday morning. Tuesday night, I packed up the quilts - all 10 of them. That's when I discovered that I never removed the chalk markings on the border of my WonderChain quilt. Uhoh. I had been told to remove them by washing and drying the quilt. Well, that wasn't about to happen at 10pm. I tried rubbing the borders together, but that didn't seem to do anything. Next, I took a moist rag, still not much luck, plus the quilt was getting damp of course. 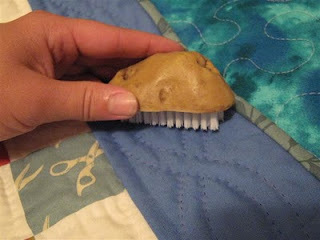 Then I had an idea: a brush. I didn't want to use a used toothbrush and also didn't want to sacrifice a new one, but I found a potato brush in my kitchen (I never used it for potatoes, it was one of those purchases). 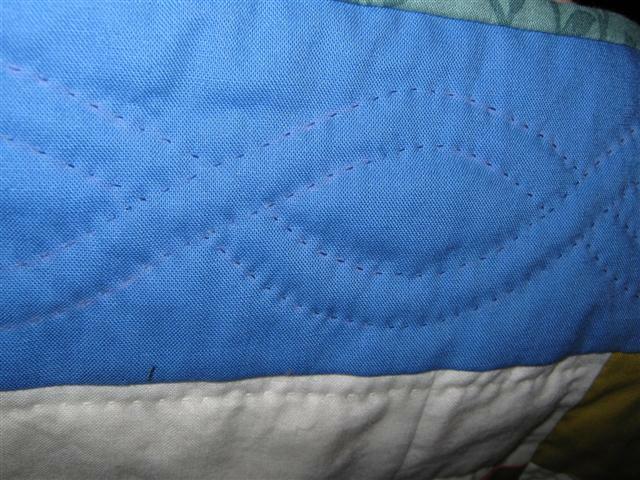 With that crisis averted, I continued rolling up quilts until I got to my Imagination 1 quilt. Uhoh. Did I ever finish quilting that? Of course not *grins*. Well, there was no short cut to this one. 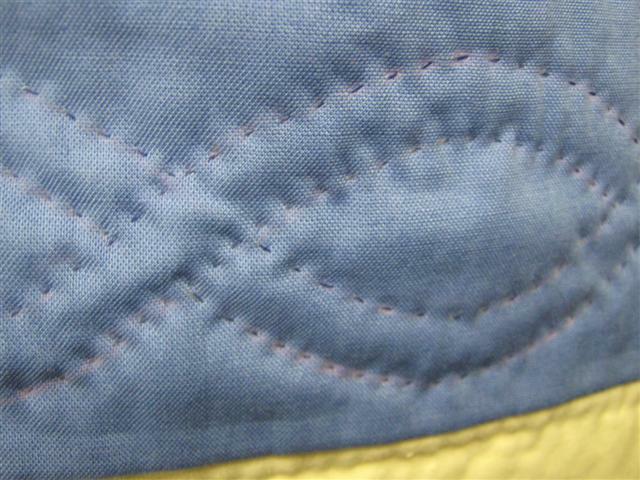 I found three seams that were obviously unfinished (e.g. 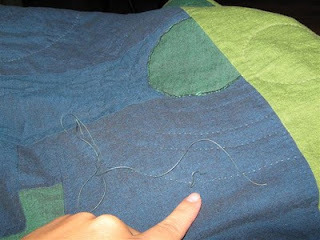 a circle stopping halfway around) and sat down to stitch those up in a hurry. See where I'm pointing? That's where the green line ended - too obvious to leave as is. we'll just keep that our little secret..teehee...I would hate to tell you how many of those "oh-oh's!" I've had. I remember a quilt show in PEI many years ago when an "oopsy" was incorporated into the workings of the quilt...pointed out by the quilter and still won ribbons. Only machines are perfect and that's if the person operating them are too. Hooray for getting all that last minute stuff done!! I can't imagine having 10 quilts to put into a show. I don't even have one finished LOL.